Eight Manitobans were taken in the 2018 NHL entry draft, including The Pas native Connor Dewar. Dewar was taken off the board with the 92nd pick by the Minnesota Wild despite being projected to go later. 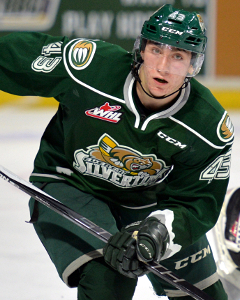 The 18-year-old is set to captain the WHL's Everett Silvertips next year in his fourth full Major Junior campaign. Vancouver made Moose Jaw Warriors defenceman Jett Woo, who hails from Winnipeg, the highest-drafted man from the province with the 37th pick. Woo tallied 25 points in 44 games last year during his second full season in the WHL. The 17-year-old captained Canada White at the 2017 World U17 Hockey Challenge. Steinbach Pistons goaltender Matthew Thiessen was also drafted by the Canucks, making him the only MJHL player selected this year. Being selected in the draft is icing on the cake for the netminder as it caps off a season that saw him help lead the Pistons to MJHL and ANAVET Cup glory. Thiessen was named to the MJHL All-Star and All-Rookie teams. The 18-year-old Altona native is committed to start playing hockey at the University of Maine after the upcoming season.